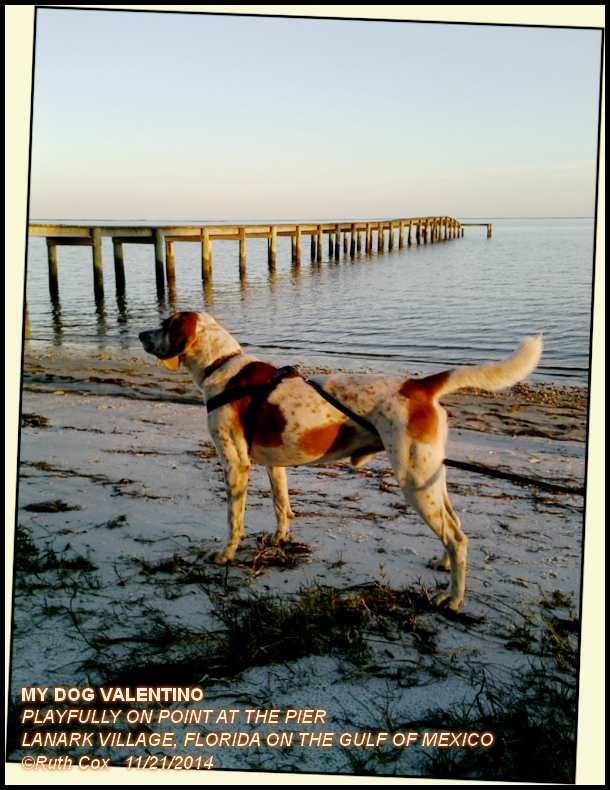 My hound dog Valentino's first day on the seashore here in Lanark Village, Florida, along the Gulf of Mexico, proved a pretty playful adventure for him as well as for me and my roommate Scott. As luck would have it, we live a block from this secluded beach, in a rural area of the Florida Panhandle, and best of all—the area is super dog friendly. Valentino spent nearly an hour with nose either in the sand or sniffing the air and with tail wagging or on point when the seabirds fed his nostrils with their scent. 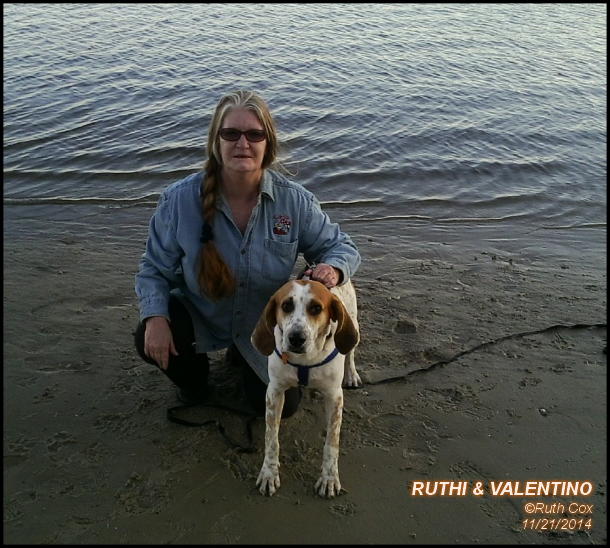 I got the feeling that for just a little while Valentino was able to romp and play just as seriously as the born and bred hunter his coonhound breeding begged of him. I think maybe the great expanse of the sea intimidated Valentino, as he was rather fearful of entering the water. Neither Scott nor I pressured him to wade the water after realizing his reaction to it. As the dog sniffed every inch of the sandy shore he would occasionally sniff the water's edge, then back away as a rippling wave rolled up over his paws. No doubt Valentino will come to terms with our sea of enchantment in his own time. But of course, we've a few ways of our own to entice him to water play, saving such for another day, for there will be many dog days at the beach for our boy. 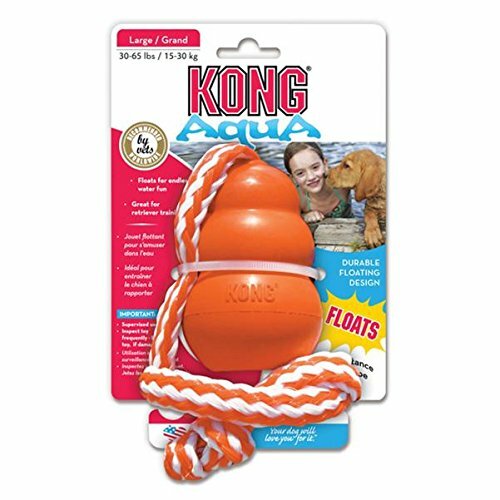 In fact, we already know which KONG toy we plan to buy next for Valentino ... KONG Aqua, a retriever dog toy that floats, complete with a throw rope. This fetching dog toy is sure to get Valentino geared up for jumping right into the water, as he loves to play fetch and he loves his KONG toys! This first day at the beach with my coonhound was quite an emotional experience for me. While it was something I'd eagerly looked forward to for two weeks, it was also something I'd somewhat dreaded, as I'd spent a year and a half walking this same beach with my dog Tidbit nearly every day. 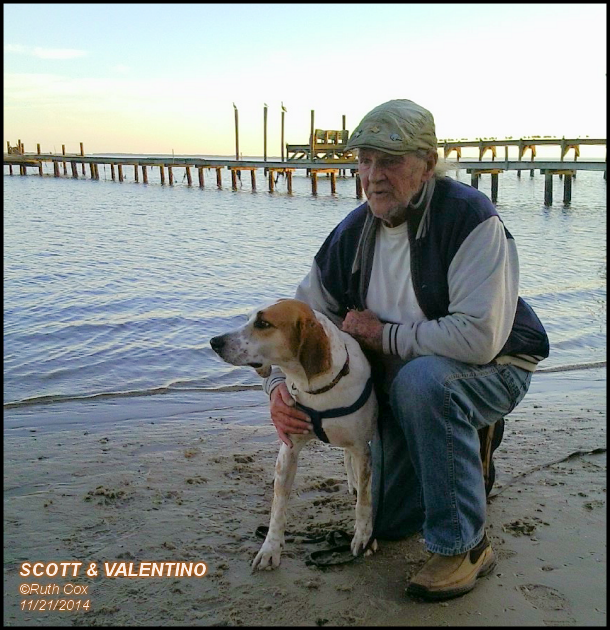 In fact, my beach walk with Valentino was my first visit to the sea since Tidbit's passing five months earlier. I know in my heart that Tidbit is leading my way and is proud of me for sharing our beach with this new dog. She was with me every step of the way, through the laughter and the tears. 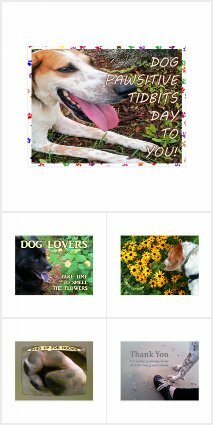 As I watched Valentino place his paw prints upon the seashore, my spirit cried for the love of the old one and I swear I heard her whisper, "The future belongs to the new. Walk now with Valentino." 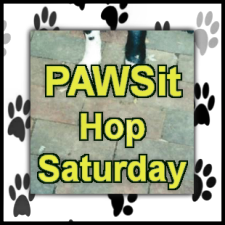 We invite you to pause for a bit, sit down and blog about a walk with a dog (or anything dog-related) and then add your blog link to this week's PAWSit Hop Saturday!